For many years the Fund’s publishing wing, Argo Books, kept Rosenstock-Huessy’s English-language works in print and issued hitherto unpublished essays as books. In 2013, the Fund closed Argo after finding another publisher willing to take on responsibility for the long-term availability of Rosenstock-Huessy’s works. That publisher is Wipf and Stock of Eugene, Oregon, who also publish Jacques Ellul and William Stringfellow. We ask you to support Wipf and Stock by buying Rosenstock-Huessy’s works from them; when you buy the books on their website, you receive a 20% discount on the retail price otherwise available, even on Amazon. They also hold periodic sales which offer even deeper discounts. To see a list of Rosenstock-Huessy’s works available from Wipf and Stock, click here. You can also search for used copies of all Rosenstock-Huessy’s books on this page. We suggest ABEBooks for the best selection (and prices often competitive with Amazon), BookFinder for the wide net cast by their search function, and Better World Books because their prices include free shipping anywhere in the world. by Eugen Rosenstock-Huessy. Harper Torchbooks, 1966. "I had two classes of readers before me when I wrote: one the free fighters, men and women between twenty and thirty who struggle with the spirit in the form of the spirit of their own age and time. To them their generation is a secret society, and it has incommunicable tastes, enthusiasms and interests which are a mystery both to its predecessors and to posterity. The other class contains the men who have experienced the spirit as the great translator from age to age because they themselves have been drafted for this supreme service. "The three men to whom this book is dedicated [Carl Muth, J.C. Oldham, and Ambrose Vernon] belong to this group. The dedication of this book is part of its ambitious aim. All these men have retranslated the forms of the spirit, for their own Church and day. They have strengthened my faith. In them I have been able to recognize the life-giving power of the Church's spirit. "The book, however, which I am allowed to inscribe with their names, is a kind of apology for my different approach to the same eternal problem. For it tries to present the difficulties of a new era and of a new generation: of the generation who showed their faith by becoming soldiers of war. The crux of my life and of the life of the young has been the same: to break the impasse between the tradition of the Holy Ghost and the workings of the spirit of the times in the courage and faith of simple soldiers. The soldier in an army has faith in some spirit. How is this related to the faith in the Holy Spirit, of the Christian tradition?" Harper Torchbook, 1966. Paperback, 248 pages. by Eugen Rosenstock-Huessy. Edited by Marion Davis Battles. Pickwick Press, 1978. To Rosenstock-Huessy, Christianity is not a religion but a historical process in which all history before Jesus plays as critical a role as the church's ongoing evolution in the Christian era; he proclaims Jesus' life, teaching, and life of action the center on which all of human history pivots. Fruit of Lips is neither an analysis of nor a commentary on the Gospels, but seeks instead to lay "the foundation for a history of the human spirit." It argues that the fourfold character of the Gospels has profound meaning for the indivisible whole they form as Christ's "lips." Beginning with Matthew, each Evangelist takes as his audience one of the existing pre-Christian social orders (tribes, empires, the Greeks, and the Jews) and each Evangelist begins at the point to which his predecessor had come at the end. In the process of writing their Gospels, the four men themselves were changed--and it is that process which marks them as Evangelists. Rosenstock-Huessy's declaration of faith in this book is the unspoken foundation of much of what he wrote elsewhere, whether in The Christian Future, Das Alter der Kirche, or his Soziologie. Written in English and completed in 1954, Fruit of Lips first appeared in print in German in 1964, when Rosenstock-Huessy made it the capstone of his two-volume Die Sprache des Menschengeschlechts. A new edition will appear soon. by Eugen Rosenstock-Huessy. Argo, 2001. In his foreword to this book, W.H. Auden writes: "Whatever he may have to say about God, Man, the World, Time, etc., Rosenstock-Huessy always starts out from his own experience as a human being, who must pass through successive stages between birth and death, learning something essential from each one of them." I Am an Impure Thinker is a collection of essays that can be read as an introduction to Rosenstock-Huessy’s thought. He was an "impure thinker" because he believed that fruitful thought can only grow from passionate conviction and engagement rather than academic "objectivity," but also because he sees the truths of Christianity present throughout mankind's long history. Taken together, these apparently unrelated essays offer an answer to Dietrich Bonhoeffer’s question: How can we speak of God to modern man who has come of age? Bonhoeffer’s close friend and biographer, Eberhardt Bethge, wrote that "Rosenstock-Huessy refuses to do anything in the usual way, but you may safely turn yourself over to him. Behind it all stands the responsibility of a great teacher committed to opening our eyes." Translated by Dorothy M. Emmet. University of Chicago Press, 2011. This book contains the correspondence between two German soldiers during World War I: Eugen Rosenstock, a logistics officer on the western front, and Franz Rosenzweig, serving in an antiaircraft outfit in Macedonia. The correspondence is both sequel to and fruit of a long conversation the two men had had with Rosenzweig's Christian cousin Rudolf Ehrenberg three years before, on the eve of Rosenstock's 25th birthday. Wolfgang Ullmann wrote that "the 'night conversation in Leipzig' [was] an event in the history of religion. The man in full possession of all idealism's heritage, convinced by his seamless faith in philosophy to take up a tragic classical position toward religiosity, encounters not only a Jewish Christianity which signals the end of Christian assimilation into Renaissance humanism, but also a type of scholarly work which has advanced into new territory beyond the theologians’ and philosophers’ dominion over the university [which had prevailed] since the 12th century." In July of 1913, Rosenstock's declaration of simple Christian faith had upended Rosenzweig's understanding of what religion was. In three months of struggle, he prepared himself to join in Rosenstock's acceptance of Christianity but, profoundly moved by the Yom Kippur services that fall, decided that while he would accept revelation on Rosenstock's terms, he would also remain a Jew, if not become a Jew for the first time. Ehrenberg was witness to his cousin's turmoil and knew of its result, but not until three years had passed did he tell Rosenstock and urge him to write his friend. Often portrayed as an attempt by Rosenstock to convert his friend, the correspondence is in fact a no-holds-barred discussion that roots in Rosenstock's acceptance of Rosenzweig's decision to become a Jew. (Paul Mendes-Flohr has pointed out that both men were converts from the paganism prevalent in academe.) Although they could unite in the affirming that "revelation was orientation," they found that their opposing views only became more pronounced in the course of the correspondence; the exchange defined both men for the rest of their lives. 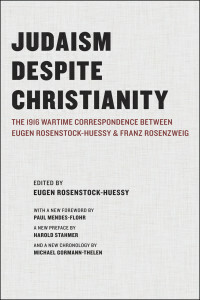 In his introductory essay, Alexander Altmann writes: "The ‘Letters on Judaism and Christianity’ of Franz Rosenzweig and Eugen Rosenstock-Huessy have rightly been described by H. J. Schoeps in Jüdisch-Christliches Religionsgespräch as one of the most important religious documents of our age." This revised and expanded edition of Judaism Despite Christianity contains the complete text of the 1969 English-language first edition, together with a new introduction by Paul Mendes-Flohr, a new preface by Harold Stahmer, a chronology of Rosenstock-Huessy's work by Michael Gormann Thelen. University of Chicago Press, 2011. Paperback, 181 pages. by Eugen Rosenstock-Huessy with Ford Lewis Battles. Pickwick Press, 1975. We owe this unusual Latin grammar to the fact that Rosenstock-Huessy's son Hans flunked Latin at the Putney School. His father felt that at least part of the problem lay in the lack of inspiring Latin texts, so he set out to draw the reader to Latin using the language of Thomas Aquinas, the Magna Carta, and Abélard, rather than that of Caesar. The book begins with a chapter on sung Latin; it rejoices in the heritage of the language, while acquainting the student with the major Latin documents of Europe's Christian heritage. "Law and religion," Rosenstock-Huessy says, "medicine and science become clear to one who uses Latin. Two-thirds of our English vocabulary is Latin. The most precious documents of English constitutional history including the Magna Charta, the basic document of Anglo-Saxon liberties are in Latin. All Christian prayers were minted in the Latin language; secular rhyme and song came into the national languages from Latin sources." Working from a draft created with his son's Latin teacher, Charles Moore, Rosenstock-Huessy produced this edition with his friend Ford Lewis Battles, translator of Calvin's Latin "Institutes of the Christian Religion" and a summertime neighbor in Norwich, VT.
by Eugen Rosenstock-Huessy. Argo, 1973. In his introduction, Rosenstock-Huessy writes: "The basis for the following chapters was formed by the lectures which, in 1935, I had the privilege to deliver at the Lowell Institute in Boston. Lectures and books try to formulate the new riddle laid before man by his own achievements. Man has succeeded in mechanizing his world. He has organized nature. For its very effectiveness, his deed raises the issue of man’s own position in nature with new acuteness." Rejecting the 19th-century obsessive focus on the individual, Rosenstock-Huessy declares that in the industrial era, "man" exists at different times in a variety of states, all of which must be recognized and reconciled to describe "man." He formulates "ecodynamic laws" to define each of the four states, and then expresses each state as a paradoxical mathematical equation: the team member who must act in solidarity with two other shifts in work around the clock is recognized in 3 x 1 = 1; the member of a community or a mass movement in ∞=1; the friend or lover in 1 + 1 = 1; the individual soul, in 1 = 1. If "man" is given a chance to be recognized in all four states, he is one, both complete and multiform. by Eugen Rosenstock-Huessy. Berg, 1993. That this book written six decades ago is without any question an extraordinary book, a remarkable book, a fascinating book, has not saved it from relative obscurity. It is directed against conventional historiography, and for the most part the conventional historians have either ignored it or denounced it. ... I have no doubt that one day perhaps soon the academic historians will discover that Rosenstock-Huessy was also one of the great pioneers in a new and significant interpretation of the history of mankind. Out of Revolution is history in the best sense of the word. Although it embodies original scholarship of the highest professional quality, it is written primarily for the amateur, the person of general education, who wants to know where we came from and whither we are headed. But it is also a theory of history: how history should be understood, how historians should write about it. The revolutions of mankind, Huessy wrote, "create new time-spans for our life on earth. They give man’s soul a new relation between present, past, and future; and by doing so they give us time to start our life on earth all over again, with a new rhythm and a new faith." This is the framework for Huessy’s history of Europe and it may safely be said to be the first historical work written under the new dispensation. As such, it is of profound significance for contemporary history, but its very uniqueness has left it high and dry on the banks of academe. Nobody knew what to make of it because nobody had seen anything like it before. Really a remarkable book, full of profound insights into the meaning of modern European history. I have not read a book in a long time which is so imaginative in relating the various economic, religious and political forces at play in modern history, to each other. Ordinary historical interpretations are pale and insipid in comparison with it. Berg Publishers, 1993. Hardbound and paperback, 795 pages. by Eugen Rosenstock-Huessy. Argo, 1981. "What is the origin of speech?" Rosenstock-Huessy argues that real speech, speech capable of transforming lives, must be and have always been formal speech, formal speech which can assemble, orient, and send forth strangers to pool their energies to create durable order and remarkable change. Intimate chitchat and everyday common sense, he says, can be nothing more than the residue of once revolutionary formal speech, the "uncommon sense" of political agreements and multi-generational projects. The Origin of Speech declares that human beings require rituals and tangible signs that they live in an orderly universe over which they possess some control. In the process of exerting power through speech, people invariably create both the past and the future as the locations of society’s hopes and fears. Rosenstock-Huessy points out that the modern mentality has consistently preferred the informal to the formal, the abstract to the ritualistic, and numerical impartiality to personal address, and hence has forfeited the sources of a "grammatically healthy" community. The Origin of Speech is Rosenstock-Huessy’s longest work on the subject of speech available in English; most of its component parts would also eventually appear in the second volume of Die Sprache des Menschengeschlechts. Argo Books, 2013. Paperback, 160 pages. by Eugen Rosenstock-Huessy, as Dienst auf dem Planeten. In Planetary Service, Rosenstock-Huessy formulates his tripartite law of technological change: every such advance shortens time, widens space, and destroys a familiar social group. "The three gifts of technology: the acceleration of time, the widening of space, and the destruction of the existing peace must be offset, and they must be offset with the help of people who have nothing to do with technology." Modern technology shrinks space and shortens time, and in its wake the question of how to change borders in a shrinking world arises. Borders cannot simply be dismissed; they protect their societies’ most important cultural heritage. And changing borders has hitherto nearly always required war; in a shrinking world, all war has become civil war. So what offers a way out, a "moral equivalent of war" in William James’ words? Rosenstock-Huessy believes that the answer to this pressing question is work service, that borders can be overcome by freely and openly addressing one another, and that shared labor creates the necessary shared space for conversation. This book is important for everyone with an interest in voluntary work services, or hopes for its eventual universal requirement, but it has its flaws. When Rosenstock-Huessy was asked to write it in 1965 (in German, for Germans), he was already 77; the 1978 translation by Freya von Moltke and Mark Huessy of necessity leaves much of that specific material aside. Their work offers the American reader vivid evidence that work-service was at the heart of Rosenstock-Huessy’s life and work. Argo Books, 2001. Paperback, 144 pages. Rosenstock-Huessy himself wrote: "When Thomas Paine exclaimed: 'These are the times that try men's souls,' he did not mean men's bodies or men's minds. And we know it." In this book devoted to knowledge of that mysterious entity, the "soul," which neither philosophers nor psychologists will have anything to do with, Rosenstock-Huessy gives that entity essential, practical meaning. Without recourse to anything mystical, transcendental, or poetic, he assures us of the reality of the individual soul for healthy human beings, and connects it to his larger work on an entirely new grammar that elevates to primacy the imperative and vocative forms of speech. 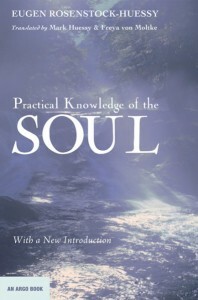 This edition of Practical Knowledge of the Soul brings to light a document long hidden from those who read Rosenstock-Huessy's works in English. With a new introduction by Hans van der Heiden, Otto Kroesen, and Henk van Olst. Rosenstock-Huessy Papers, Volume I is a feast of ideas in nine essays. Although these essays make diverse and delightful digressions, the volume primarily addresses three topics: science, education, and religious discourse. Several of these essays have appeared in the two German books, Der Atem des Geistes (The Breath of the Spirit) and Die Sprache des Menschengeschlechts (The Speech of Mankind). Rosenstock-Huessy describes the progress of scientific knowledge as a human social endeavor, rather than as a search for proper methods or as the product of lone genius. Human beings take up particular roles and positions relative to others in the process of inquiry hence, Michael Faraday was a "classic" and Paracelsus a "founder" in their own times. Given that the 1980s and 1990s have witnessed a national and international interdisciplinary movement to study the rhetoric of science, Rosenstock-Huessy’s essays, "A Classic and a Founder," "The Science of Bodies and the Appeal to Somebody," and "The Metabolism of Science," written many years ago deserve a wide reading today. As his books and transcribed lectures attest, Rosenstock-Huessy often wrote and spoke of education. "Man Must Teach," his reflection on Augustine’s De Magistro, and "Time Bettering Days" are two of his profound contributions to educational thought, and both focus on time as their main theme. Rosenstock-Huessy argues persuasively in these essays that education is a meeting of people with different generational experiences. He also outlines why school must have a calendar that sets it apart from the workaday world. In "Liturgical Thinking" and "The Generations of the Faith," Rosenstock-Huessy illustrates the complexity of both the Catholic and Protestant traditions. These essays, plus "Our Urban Goggles" and "The Future Way of Life" which are also published in this anthology make evident that most people today have settled for an impoverished version of Christianity that is a compromise with modernist dogmas. Rosenstock-Huessy urges each new generation to refound Christianity by bringing it to bear critically on the events of modern life. Paperback (bound photocopies of original essays), 245 pages. "The author believes as did Dilthey before him that social sciences must suffer from being forced into the methodological mold of the natural sciences. Anyone acquainted with the kind of psychology and sociology commonly taught in the United States today could hardly fail to agree, and there is in fact currently a good deal of dissatisfaction with the naturalistic model used in these sciences. But where do we look for a better method? "Rosenstock-Huessy suggests that we look to language. Speech is the basic social reality. Grammar, in turn, is the science which describes and analyzes the structures of language. Hence grammar is the foundation for developing a methodology for the social sciences. It must be added at once that it is not conventional grammar that the author has in mind. The grammar we learn in school and which enables us to reel off conjugations and the like is a grammar which has killed the drama and dignity of living speech. Rosenstock-Huessy has in mind a renewed grammar, a "higher grammar," as he sometimes calls it, which will attend to the nuances of tense and mood, and will see in these the structures of the social reality.... This book could make very helpful contributions toward working out a more human approach to the study of the human phenomenon." Eugen Rosenstock-Huessy spoke in epigrams, and this is a collection of them, nuggets mined from his publications and lectures. Life Lines provides an excellent, light, and enlightening introduction to Rosenstock-Huessy. It is also a delightful companion for those who are entranced by his pithy style. It contains a brief bibliography of Rosenstock-Huessy’s books and a short biography. Chapter titles are: The Individual and Society, Time, Speech, Religion, History, and Thought and Science. Any original thinker knows that he has to jump; later you can build bridges. Never will a child be at peace which has not meant the world to somebody and has been spoken to as though it were the only child on earth. People who have neither inherited something nor bequeathed something worth inheriting vanish without a trace. He who believes in nothing still needs a girl to believe in him.